Veszprém ([ˈvɛspreːm]; German: Weißbrunn, Slovene: Belomost) is one of the oldest urban areas in Hungary, and a city with county rights. It lies approximately 15 km (9 mi) north of the Lake Balaton. It is the administrative center of the county (comitatus or 'megye') of the same name. The name of the city originates from a Slavic personal name Bezprem (Proto-Slavic Bezprěmъ) meaning "stubborn", "self-confident, not willing to retreat". Besprem (before 1002), Vezprem (1086), Bezpremensis (1109). The form Vezprem originates in early medieval scribal habits and frequent exchange of B and V under the influence of Greek. The city was named either after a chieftain, or the son of Princess Judith (elder sister of St. Stephen of Hungary), who settled here after her husband Boleslaus I of Poland expelled her and her son. Veszprém lies on both sides of the Séd creek, approximately 110 km (68 mi) from Budapest (via the M7 highway and Road 8). 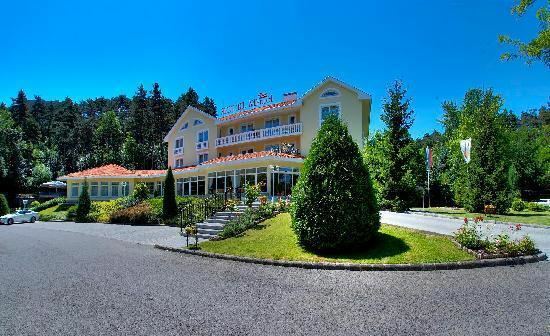 It can also be reached from Győr via Road 82 and from Székesfehérvár via Road 8. 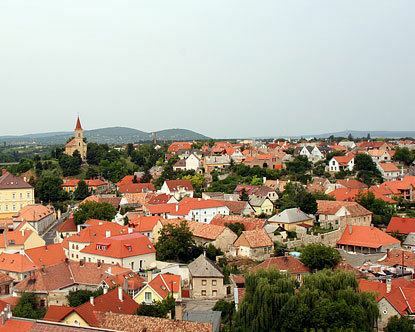 According to legend, Veszprém was founded on seven hills. The seven hills are Várhegy (Castle Hill), Benedek-hegy (St. Benedict Hill), Jeruzsálem-hegy (Jerusalem Hill), Temetőhegy (Cemetery Hill), Gulyadomb (Herd Hill), Kálvária-domb (Calvary Hill), and Cserhát. Anonymus Belæ Regis Notarius (the anonymous notary of King Béla III) wrote that a castle already stood here when the Hungarians first occupied the area. The castle was probably a 9th-century Frankish fortress. The castles of Veszprém, Esztergom and Székesfehérvár, were the earliest Hungarian stone castles, which had already been built during the reign of High Prince Géza, a time when motte castles were much more common. Veszprém had an important religious role during the struggle to make Christianity the official religion of Hungary - Stephen I of Hungary defeated the armies of his chief opponent, Koppány, near Veszprém. The city became the first episcopal seat of Hungary in 1009 and an archiepiscopal seat in 1993. Comitatus Veszprém was one of the earliest historical counties of Hungary. During the 13th century Mongol invasion of Hungary, Veszprém was protected by its castle. Veszprém was the favorite city of Queen Gisela, the wife of St. Stephen. For centuries, the queens of Hungary were crowned by the bishop of Veszprém. The city is still often called "the city of queens". In the year 1294 Queen Fenenna confirmed that, at that time, the former(!) Queen Elizabeth had the privilege to collect the donations of the church in the Veszprém County. Veszprém was among the first Hungarian cities to have a university - students studied law and arts here for several centuries. The university was destroyed by fire in 1276. Veszprém became a university town again in the 20th century. Veszprém changed hands between Austrians and Ottomans until 1684 after the Battle of Mohács in 1526. It was known as "Pespirim" and was a sanjak centre in Budin Province during Ottoman rule. The town was plundered by the Turks in 1552, but they could not maintain occupation: the region north of lake Balaton remained in the Kingdom of Hungary (1538–1867) (captaincy between Balaton and Drava). The castle was demolished in 1706. Until 1918, VESZPRIM (also named WESZPRIM and WESPRIM near 1850, and WEISSBRUNN in German) was part of the Austrian monarchy, province of Hungary; in Transleithania after the compromise of 1867 in the Kingdom of Hungary.